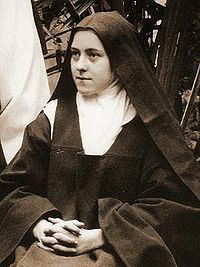 Thérèse, the Carmelite nun who lived from 1873-1897, has helped people for more than a century think about their lives and prioritizing their everyday work as sacred. Thérèse looked at the work of ordinary life as sacred. She called it “The Little Way”emphasizing that everyday tasks are sacred. We do not need to do them perfectly. When we do our work, no matter how small, with our whole heart, it is done right. Thérèse knew she wanted to enter the French Catholic convent by the age of 13 and dedicate her life to God. Her whole life she had heard the stories of the saints. Living her life like a saint seemed impossible. It was then she began to think in terms of “The Little Way”. She knew she could do her work with love and in the name of Christ. So that is what she set out to do. Thérèse even asked for and received permission to remain a novice. She would remain a “beginner” for the rest of her life. I recommend reading Holy Simplicity: The Little Way of Mother Theresa, Dorothy Day and Thérèse of Lisieux by Joel Schorn . It not only tells the faith story of Thérèse of Lisieux but also how Mother Teresa and Dorothy Day were influenced by The Little Way.